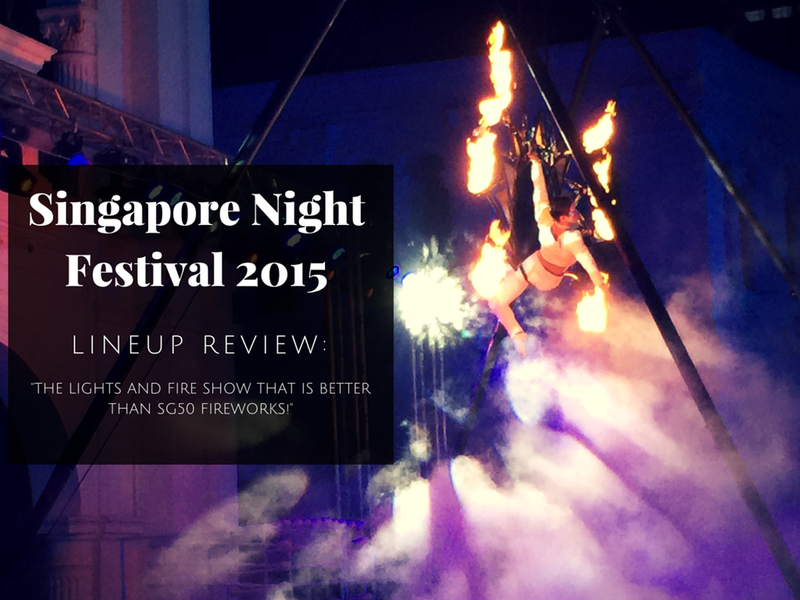 2015 Singapore Night Festival - The Lights and Fire Show that is Better than SG50 Fireworks! Singapore Night Festival returns for the 8th installment this year. Held on the Fridays and Saturdays of 21 Aug 2015 - 29 Aug 2015, the Evilbean was left in awe, smoke and gas after he went down on the 22nd. The INSANE crowd, along with various white tents selling various snacks and beers, livened up the entire Bras Basah/Bugis area. This was the first time I experienced this kind of carnival ambience in Singapore. And there was this performance that blew me away. Put up by Starlight Alchemy, the three 25-minutes segment during the night tells the journey of reconciliation between Apollo from the world of Ethereal Light and Nuri from the world of Eternal Flame through a variety of aerial and large custom-made fire props, as well as LED technology performance props. IT WAS AMAZING! Unfortunately, we missed Act I of the show, which was held at 8:00 PM. We caught Act II at 9:30 PM across the road, which wasn't really a good place to watch the performance as buses travelling along that road will block out your view entirely. Act II was a show that was predominantly on fire, which, given my limited arts understanding, is probably the introduction of Nuri who is from the world of Eternal Flame. The sequence which they fought with swords on fire was EXHILARATING, made even more so with the dramatic orchestra music! We stayed around the area for Act III, which was held at 11:00 PM. Like a typical kiasu Singaporean, we went down to chope for the premium front-row space half an hour before Act III starts. Got more kiasu people than us okay? There were already tons of people at the stage area at 10:30! If Act I was a show using lights, and Act II was dominated by fire, what would Act III be? YEAP SMART! Act III is the final segment that showcases the union of Apollo from the world of Ethereal Light and Nuri from the world of Eternal Flame. In other words, we will be treated to a fire and lights extravaganza in the final act! I was at the NDP SG50 fireworks as well and honestly, I felt that this performance put up by the members of Starlight Alchemy was so much more impressive than the fireworks. You could see the amount of hardwork that they put in to synchronise not only with each other, but also with the LED props that they used. That is not to mention the danger of those flame torches. My heart palpitated when the aerial lady was maneuvering on that prop on fire. The makeup, the details of the costume and the sound effects were so on point! I gave them my loudest clap when the show ended. I was glad that we headed down to the Singapore Night Festival caught this lights and fire show that is better than NDP fireworks!